, earl of Orford, grandson of sir Edward Walpole, K. B. and third son of Robert Waipole, M. P. for Castle-Rising, in Norfolk, was born at Houghton, in Norfolk, Aug. 26, 1676. 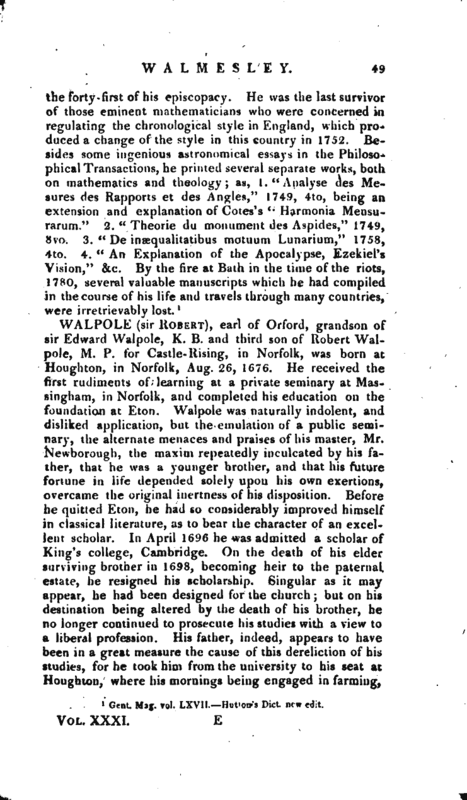 He received the first rudiments of learning at a private seminary at Massingham, in Norfolk, and completed his education on the foundation at Eton, Walpole was naturally indolent, and disliked application, but the emulation of a public seminary, the alternate menaces and praises of his master, Mr. Newborough, the maxim repeatedly inculcated by his father, that he was a younger brother, and that his future fortune in life depended solely upon his own exertions, overcame the original inertness of his disposition. Before he quitted Eton, he had so considerably improved himself in classical literature, as to bear the character of an excellent scholar. In April 1696 he was admitted a scholar of King’s college, Cambridge. On the death of his elder surviving brother in 1698, becoming heir to the paternal estate, he resigned his scholarship. Singular as it may appear, he had been designed for the church; but on his destination being altered by the death of his brother, he no longer continued to prosecute his studies with a view to a liberal profession. His father, indeed, appears to have been in a great measure the cause of this dereliction of his studies, for he took him from the university to his seat at Houghton, where his mornings being engaged in farming, | or in the sports of the field, and his evenings in convivial society, he had no leisure, and soon lost the inclination, for literary pursuits. In July 1700, he married Catherine, daughter of sir John Shorter, lord mayor of London, and his father dying, he inherited the family estate of somewhat more than 2000l. a year. In the next session of parliament Walpole opposed the ministry in every thing; and even Wyndham or Shippen did not exceed him in patriotism. 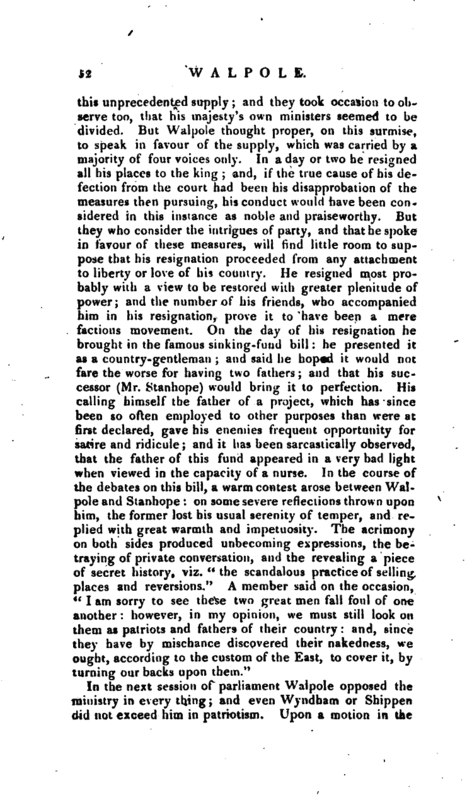 Upon a motion in the | House for continuing the army, he made a speech of above an hour long, and displayed the danger of a standing army in a free country, with all the powers of eloquence. Early in 1720 the rigour of the patriot began to soften, and the complaisance of the courtier to appear; and he was again appointed paymaster of the forces, and several of his friends were found soon after in the list of promotions. No doubt now remained of his entire conversion to courtmeasures; for, before the end of the year, we find him pleading as strongly for the forces required by the waroffice as he had before declaimed against them, even though at this time the same pretences for keeping them on foot did not exist. bert Walpole did not say, as usually 4to edit. | prevailed, and he was not any longer able to carry a majority in the House of Commons. He now resigned all his places, and fled for shelter behind the throne. But there is so little appearance of his credit receiving any diminution that he was soon after created earl of Orford, and most of his friends and dependants continued in their places. The king too granted him a pension of 40QO/. in consideration of his long and faithful services. 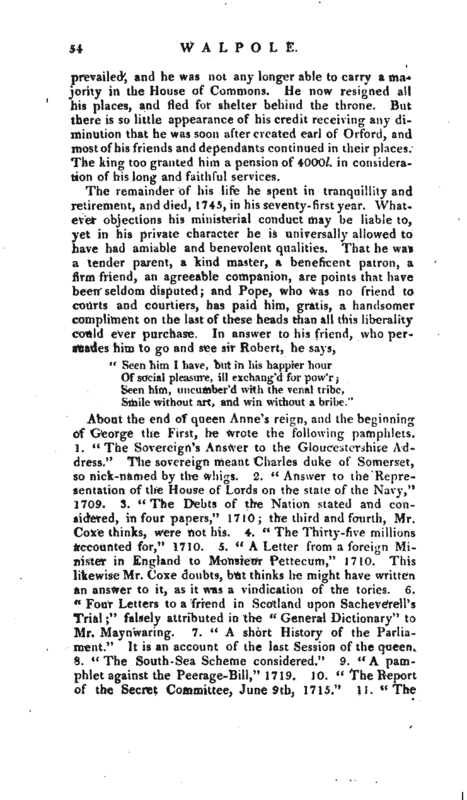 About the end of queen Anne’s reign, and the beginning of George the First, he wrote the following pamphlets. 1. “The Sovereign’s Answer to the Gloucestershire Address.” The sovereign meant Charles duke of Somerset, so nick-named by the whigs. 2. “Answer to the Representation of the House of Lords on the state of the Navy,” 1709. 3. “The Debts of the Nation stated and considered, in four papers,” 1710; the third and fourth, Mr. Coxe thinks, were not his. 4. “The Thirty-five millions accounted for,” 1710. 5. “A Letter from a foreign Minister in England to Monsieur Pettecum,” 1710. This likewise Mr. Coxe doubts, but thinks he might have written an answer to it, as it was a vindication of the tories, 6. “Four Letters to a friend in Scotland upon Sacheverell’s Trial;” falsely attributed in the ‘’General Dictionary“to Mr. Ma>nwariiig. 7. ‘< A short History of the Parliament.” Ims an account of the last Session of the queen, 8. 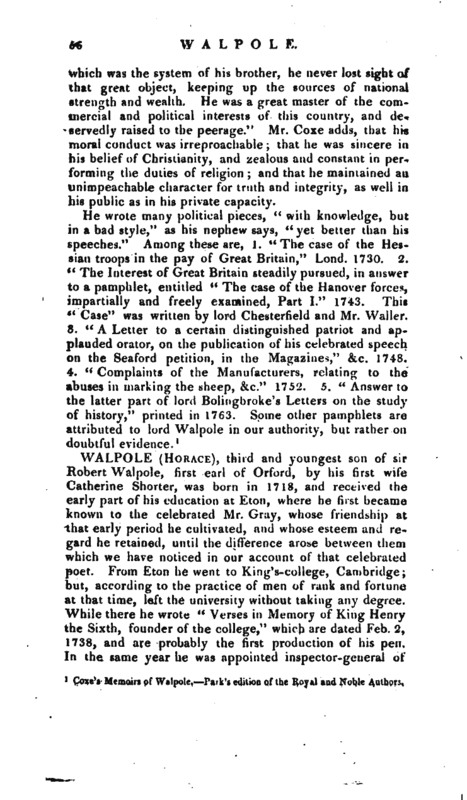 “The South Sea Scheme considered.” 9. 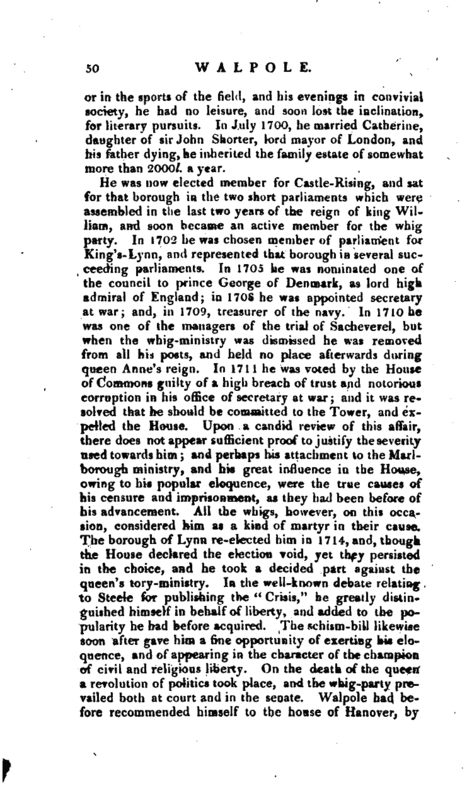 “A pamphlet against the Peerage-Bill,” 1719. 10. 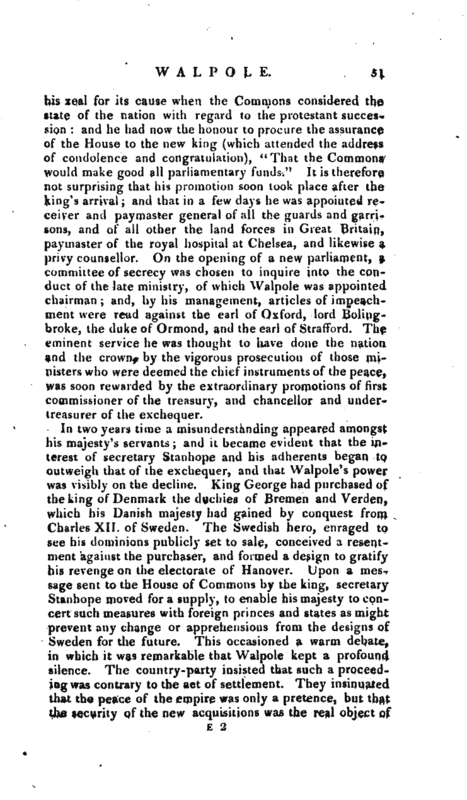 “The Report of the Secret Committee, June 9th; 1715.” 11. “The | Thoughts of a Member of the Lower-house, in relation to a project for restraining and limiting the power of the Crown in the future creation of peers,” 1719. 12. “The Report of the Secret Committee, June 9, 17 15.” 13. “A private Letter from General Churchill after Lord Orford’s retirement,” which has been considered as indicating a love of retirement, and contempt of grandeur; but it wilj. probably appear to be rather an affectation of contentment with a situation which he could no longer change. Amidst all his knowledge, he had laid up very little for the purposes of retirement. 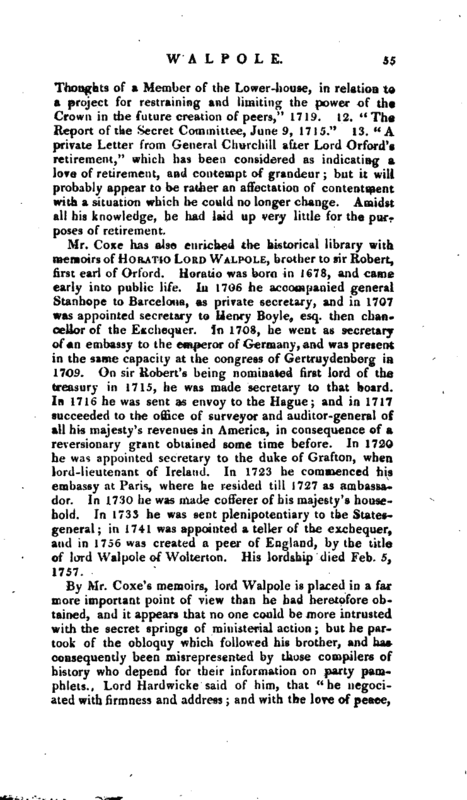 Mr. Coxe has also enriched the historical library with memoirs of Horatio Lord Walpole, brother to sir Robert, first earl of Orford. Horatio was born in 1678, and came early into public life. In 1706 he accompanied general Stanhope to Barcelona, as private secretary, and in 1707 was appointed secretary to Henry Boyle, esq. then chancellor of the Exchequer. In 1708, he went as secretary of an embassy to the emperor of Germany, and was present in the same capacity at the congress of Gertruydenberg in 1709. On sir Robert’s being nominated first lord of the treasury in 1715, he was made secretary to that board. In 1716 he was sent as envoy to the Hague; and in 1717 succeeded to the office of surveyor and auditor-general of all his majesty’s revenues in America, ’in consequence of a reversionary grant obtained some time before. In 1720 he was appointed secretary to the duke of Grafton, when lord-lieutenant of Ireland. In 1723 he commenced his. embassy at Paris, where he resided till 1727 as ambassador. In 1.730 he was made cofferer of his majesty’s housebold. In 1733 he was sent plenipotentiary to the Statesgeneral; in 1741 was appointed a teller of the exchequer^ and in 1756 was created a peer of England, by the title of lord Walpole of Wolterton. His lordship died Feb. 5, 1757. 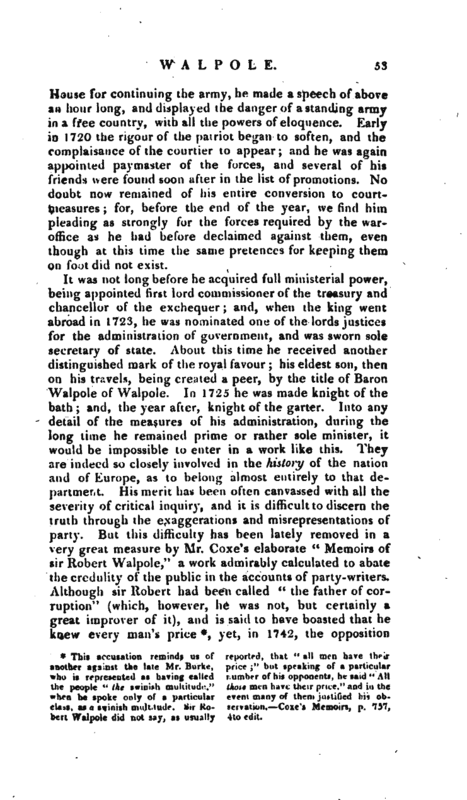 By Mr. Coxe’s memoirs, lord Walpole is placed in a far more important point of view than he had heretofore ob-r tained, and it appears that no one could be more intrusted with the secret springs of ministerial action; but ne partook of the obloquy which followed his brother, and has consequently been misrepresented by those compilers of history who depend for their information on party pamphlets. Lord Hardwicke said of him, that “he negociate’d with firmness and address; and with the love of peace, | which was the system of his brother, he never lost sight of that great object, keeping up the sources of national strength and wealth, He was a great master of the commercial and political interests of this country, and deservedly raised to the peerage.” Mr. Coxe adds, that his moral conduct was irreproachable; that he was sincere in his belief of Christianity, and zealous and constant in performing the duties of religion and that he maintained an unimpeachable character for truth and integrity, as well in his public as in his private capacity.